Since the initial launch of the Windows Azure Toolkit for iOS, we’ve not only updated & changed the library, but we’ve also renamed the repository. For the latest information, please visit our github repository at http://github.com/microsoft-dpe/ – from here you can get access to the iOS library, Android library, and all the additional tools we’ve made available. 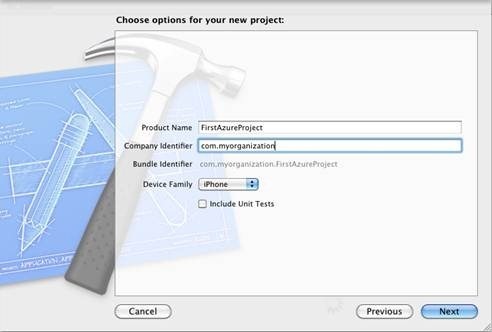 I am extremely excited to announce the immediate availability of the Windows Azure Toolkit for iOS! 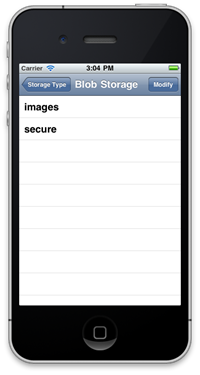 This first release of the Windows Azure Toolkit for iOS provides an easy and convenient way of accessing Windows Azure storage from iOS-based applications. As with the Windows Azure Toolkit for Windows Phone 7 we will continue to bring additional capabilities to the toolkit, such as push notifications, Access Control Service, and more. The toolkit works in two ways: the toolkit can be used to access Windows Azure storage directly, or alternatively, can go through a proxy service. The proxy service code is the same code as used in the Windows Azure Toolkit for Windows Phone 7 and negates the need for the developer to store the Azure storage credentials locally on the device. 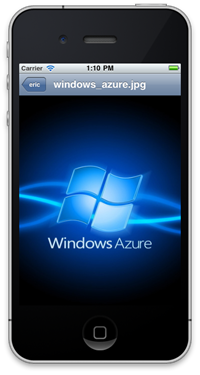 The release of the Windows Azure Toolkit for iOS is a significant milestone, and reinforces my opinion that Windows Azure is a great place to run services for mobile applications. To quickly get your mobile services up and running in Windows Azure, take a look at the Cloud Ready Package for Devices (found under downloads in https://github.com/microsoft-dpe/watoolkitios-lib). The Cloud Ready Package for Devices is designed to make it easier for you to build mobile applications that leverage cloud services running in Windows Azure. Instead of having to open up Visual Studio and compile a solution with the services you want to use, we provide you with the Windows Azure CSPKG and CSCFG files prebuilt - all you need to do is update the configuration file to point to your account. In this video, you’ll see how easy it is to deploy this package to Windows Azure regardless of your operating system (e.g. Windows 7 or OSX) and target device (e.g. Windows Phone 7, iOS, or Android). 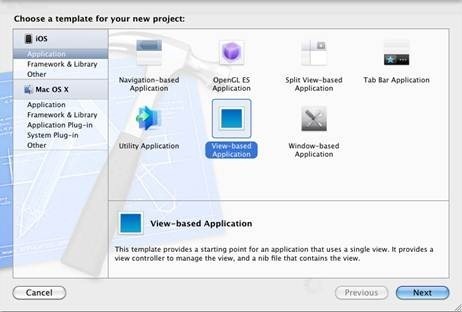 Select a View-based application and click Next. Give the project a name and company. For the purposes of this walkthrough, we’ll call it “FirstAzureProject”. Do not include Unit Tests. Pick a folder to save the project to, and uncheck the source code repository checkbox. Locate the libwatoolkitios.a library file from the download package folder (from either the simulator or device folder), and add it to the Frameworks folder. 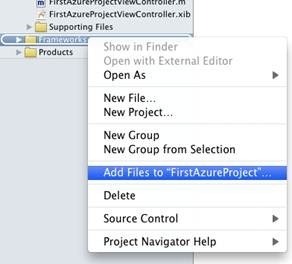 Now, click on the top most project (FirstAzureProject) in the left hand column. Click on the target in the second column. Click on the “Build Settings” header in the third column. Ensure that the “All” button is selected to show all settings. Double-click on this line (towards the right of the line), and click on the “+” button in the lower left. Add the path to where the folder containing the header files are located (this is the include folder from the download). For example, “~/Desktop/v1.0.0/include” if you have extracted the folder on your desktop. Be sure to encapsulate in quotes if you have spaces in the path. Click on the “+” button in the lower left, and scroll down until you find a library called “libxml2.2.7.3.dylib”. Add this library to your project. Perform a build. If the build succeeds, the library is correctly added to the project. If it fails, it is recommended to go back and check the header search paths. Be sure to replace ACCOUNT_NAME and ACCOUNT_KEY with your Windows Azure storage account name and key, available on the Windows Azure portal (https://manage.windowsazure.com). The last line shows that this account has 2 containers. This will of course vary, depending on how many blob containers you have setup in your own Windows Azure account. In the didFinishLaunchingWithOptions method, after the [self.window makeKeyAndVisible] line, try testing a few of the following commands. Again, running the project will return results into the debugger window. Replace the PROXY_URL, USERNAME, and PASSWORD with the information required to access your proxy service. If you are looking to explore the toolkit further, I recommend looking at the sample application that can be found in the watoolkitios-samples project. 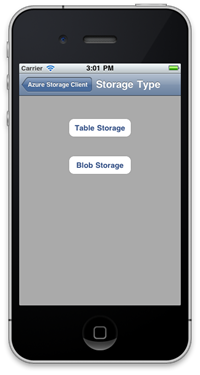 This project demonstrates all of the functionality of the toolkit, including creating, uploading, and retrieving entities from both table and blob storage. This work by Wade Wegner is licensed under a Creative Commons Attribution 4.0 International License. Unless otherwise noted, all code samples are licensed under the Apache 2.0 License.